Don’t Miss the Ukranian Designer Presenting a Stunning Interior Design Project featuring Excellent Lighting! 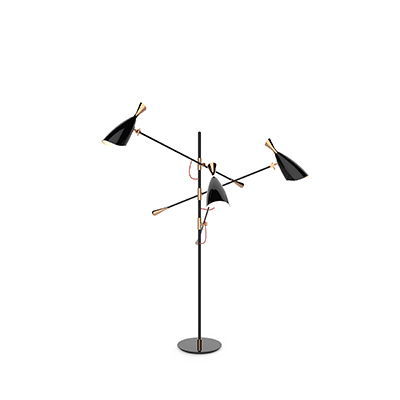 Mid-Century lighting is one of the wonderful aspects of the lighting world. Full of inspiration, elegance and style, the mid-century style is one of the best. With a modern living room even better, you can’t miss this design. NPL project was designed by Alena Makagon, a Ukranian designer. The mid-century lighting was, absolutely, a key feature in the design of this interior design project. Warm and elegant, the use of dark colours against the vibrant blue add up to the charm to the living room decor. Giving space to a cosy dining room that had the most delicate decor, this modern home design is one of a kind. A cosy and charming dining room decor, with simple and stylish furniture, makes this small dining room shine through their dining room lighting. Hanna, a vintage lighting fixture that is elegantly by five arms and five lampshades made in brass. This classic pendant light suits superbly in a mid-century modern living room or dining room. The master bedroom decor excels in elegance and class. The dark tones furnish the room with mystery and the big windows let the shine through and fill the space with natural light. The decorative pieces weren’t left behind, just like the mid-century lighting fixtures presented. The mid-century wall lamps provide an exquisite touch to the room while setting the mood. Miles wall lamp has the desire to represent the impressive charisma of this outstanding jazz singer, in its innovative and sophisticated lighting features. With a classy, intriguing contemporary silhouette, Miles mid-century modern wall sconce is the perfect bedroom wall light, since it will suit exquisitely in your interior design as your bedside reading lamp.